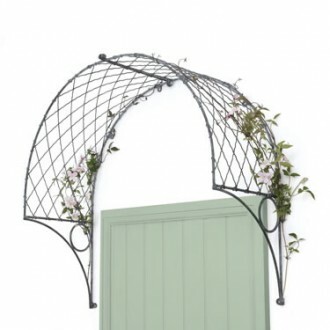 Don’t get strangled by the Triffids round your doorway this summer, help is at hand! Our wirework lattice canopies are the ideal solution to lift and support the most energetic climbing plants. The ideal choice for a front door canopy would be the Roman Door Canopy shown, as it lifts the plant up above the lintel yet allows enough room below for any wall light or glazed fanlight. The crimped and woven lattice wirework is made by us in the time honoured fashion and will last a lifetime. All of our door canopies are fully welded and easy to install, and we also include the fixings to fit them. A pair of matching wall panels positioned either side of a doorway helps train the plants up from the ground or planter, and creates a very pleasant composition.